in west africa the birth of twins is a rare and much revered occurrence. 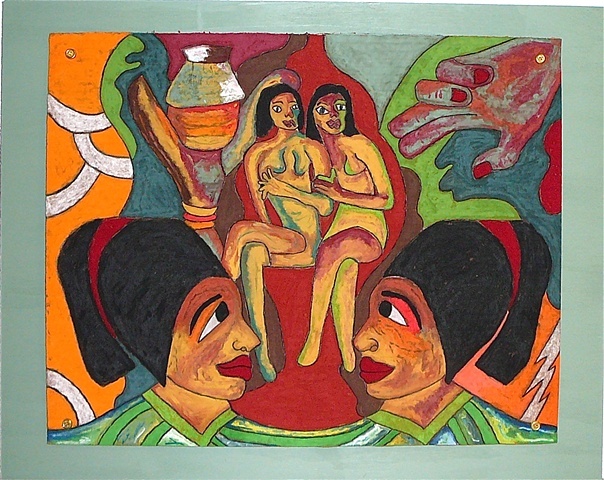 when twins are born the mother (and families) visit the fetishman and offerings are given to the "twin fetish". these are feathers, blood, animal sacrifice, etc. in many of the small villages neal and i visited there were a plethora of "twin fetishes". when a twin dies (the mortality rate is extremely high for all babies in west africa) the mother wears a "doll" wrapped in the front of her clothes. when the mother feeds the still alive twin she also feed the "doll" that "represents" the dead twin. she does everything with the "doll" that she does for the still alive twin. neal and i had seen a lot of women with dolls in the front of their clothes and were not sure why they were wearing "dolls". once the "twin fetish" was explained to us it made sense. Gorgeous and the information was very interesting as well! There's something Gauguinish about your work that I like..Reminds of his Noa Noa years. Wow, what can I say, except original, groooooooooooovy, love it! Amazing how everything somehow connects, had I not read your commentary I would have sworn the work to be Polynesian. Que interesante la explicación de los gemelos en esa zona de África, gracias. Bello el reflejo de los gemelos, saludos. .I did not know this story of twins ... rare events are celebrated well .....i wish you a great new year! really enjoy this one. thanks. Very Cool! I'm the sister of Twins, and even in our relatively young american culture there's lingering residual mystique involved in the whole twin phenomenon!! Nice Piece. Very interesting cultural narrative!! This is really amazing. I love the culture lesson too. Really wonderful. Excellent colors! Thanks for the information, Jennifer. I really like this image! The composition, the colors, all... congratulations! Great work ... love it, Jennifer !! Fantastic art and interesting information !!!! This one is so full of joyful colours and warm atmosphere for me!! Love it! Congratulations! HELLO JENNIFER-----YOUR WORK IS UNIQUE!!!!!! Wonderful image, Jennifer, and a very interesting description. A fantastic painting and such a pleasure to visit your website!!! It's a greAt pleasure to be here!!! Still love this one! Good to see it again! Jennifer, the ongoing emotional integrity of your work consistently moves me. You go from strength to strength! I hope you can ignore the inappropriate gibberish above that was my first, gut reaction and know I respect you and your work. Thank you. Take care. Julian. An interesting description, and a first rate piece of art. Very well done. Terrific work Jennifer, I found your info really interesting and the idea of a twin doll I thought was beautiful. I think most who have lost loved ones have some little item of theirs so we just feel that little bit closer to them. Really, really wonderful art, Jennifer ! Love it !! A lovely pastel painting, Jennifer, with very rich colours! Beautiful composition and such a wonderful presentation too! Fabulous information behind this creative artwork too!